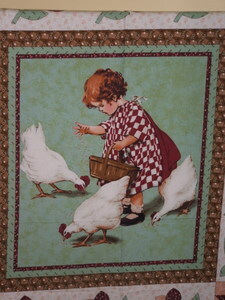 I purchased this panel at the Australasian Quilt Convention we visited at the end of February. It reminds me of school holidays spent at my maternal grandparents home, and many times ‘feeding the chickens’. I am going to piece it into the centre of a quilt I’ll call My Favourite Things.